For global project reports you can use all data of all projects you have access to. However, you can select data from a specific project, too. 2.Afterwards, open the Start tab and click on Reports >> Create Report. 3. A new window will open. Therein you determine the project/projects you want to include in your report. All Projects: Data of all projects you have access to, will be included in the report. Selected Projects: First, mark all projects you want to include in the project list and then click on Create Report. Now, you can choose Selected Projects in the new window and all projects you have marked before in the project list will be included. Tip: To select multiple projects at the same time, press the CTRL-Button on your keyboard and select the projects from the project list. 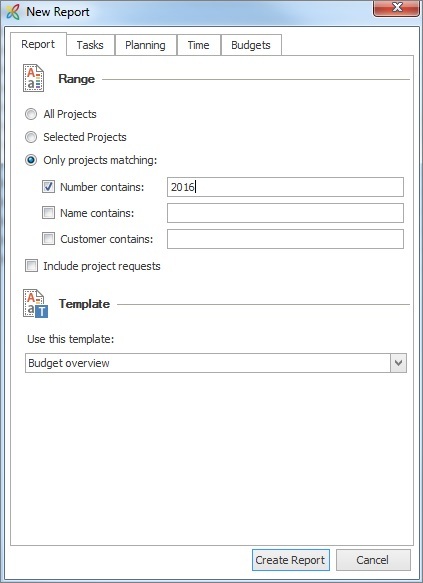 Only projects matching: Here you can include projects by filtering by criteria like project number, project name or customer. For example: If the project number includes the year and you only want to include projects from the year 2016 to you report, you enter “2016” in the field Number contains. 4. Moreover, you can include project requests by ticking the check-box Include project requests. In the case of project requests some of the default reports do not make sense, because usually project requests do not contain very much information expect information from the management page. 5. Choose the template you want to use. For more information on in InLoox included standard templates, read >> Standard InLoox reports. Create global project reports | InLoox 9 for Outlook • Copyright 1999-2019 © InLoox, Inc. All rights reserved.